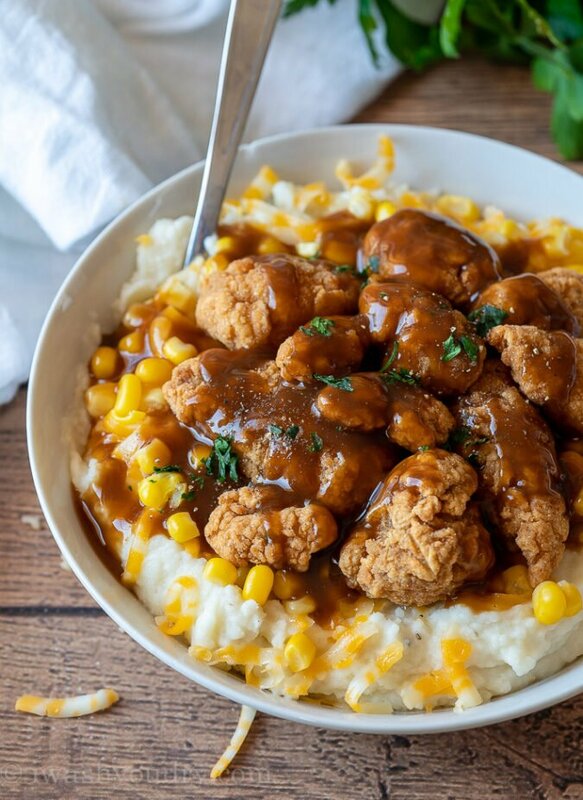 I’m excited to partner with Bob Evans Grocery once again on this down right delicious, comforting dinner recipe. Whenever I’m in need of a quick and easy dinner, that requires very little prep, this is what I reach for. My whole family absolutely loves this super easy meal and so do I. 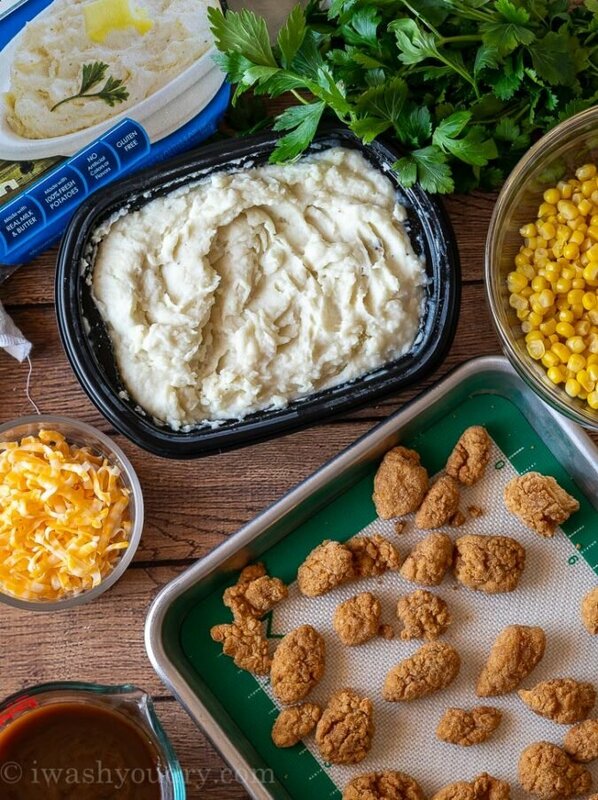 Start by cooking up some breaded popcorn chicken, chicken strips or chicken nuggets (whichever you prefer). My favorite way to heat up the chicken is in my Air Fryer because it takes just a fraction of the time. 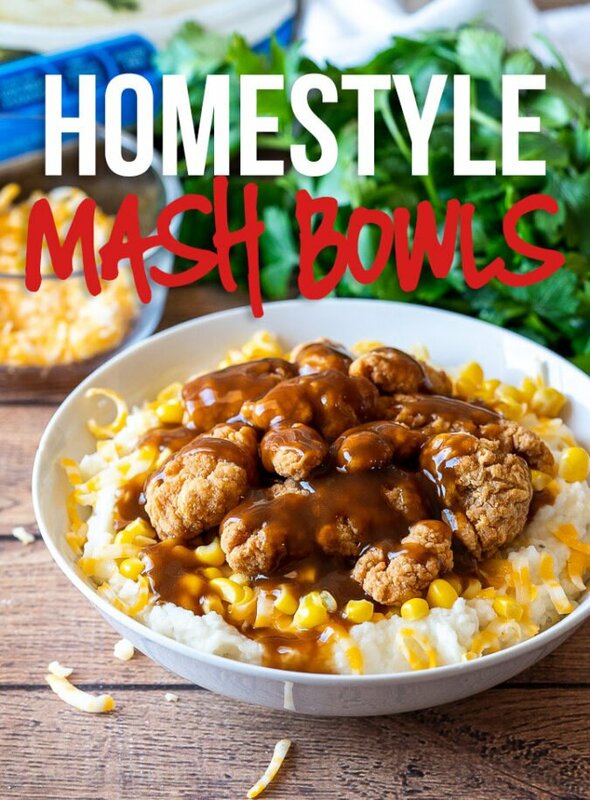 Warm up a couple packages of Bob Evans Original Mashed Potatoes in the microwave and place in bowls. 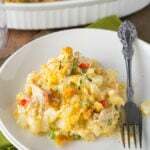 Top with shredded cheese, cooked corn kernels, the cooked chicken and a drizzle of warm brown gravy. Whenever I pull out the packages of Bob Evans Mashed Potatoes from the fridge, my kids get super excited. They love the taste, texture and flavor of these potatoes. 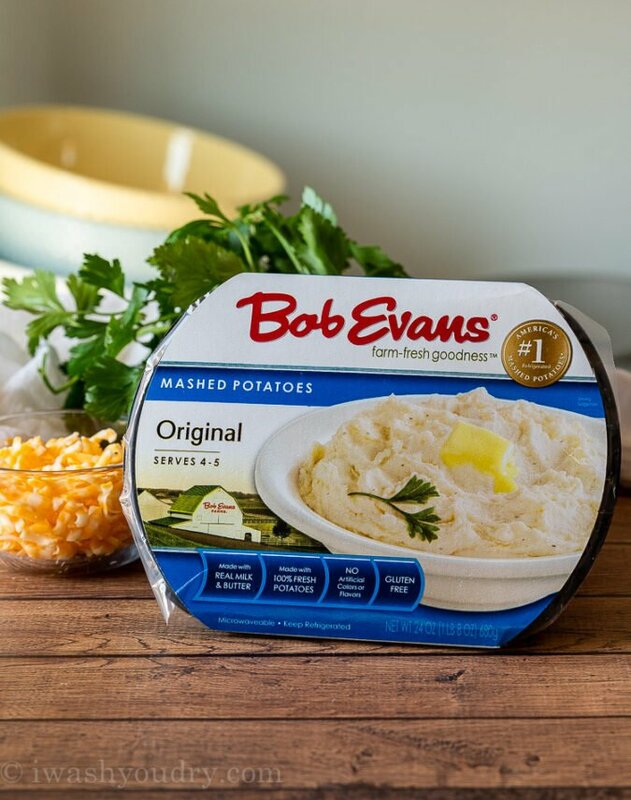 You can find Bob Evans Mashed Potatoes (as well as their other delicious side dishes) in the refrigerated section of your grocery store. They’re made with real milk, butter and potatoes with no artificial colors or flavors. Just real down-home goodness! VEGGIES: You can use any sort of vegetables you like with this recipe in place of corn. I usually have several cans of corn on hand so that’s what I always grab. 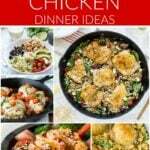 CHICKEN: I keep bags of frozen, breaded chicken in my freezer for quick meals like this. You can also use fresh chicken that’s been grilled. 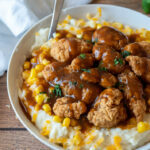 GRAVY: To keep this recipe simple, I’ve just used a canned brown gravy, but you can also use a gravy mix, or make your own. 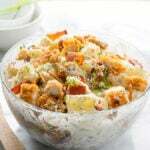 This Poutine Gravy recipe would work great! The best part about this recipe is when you get a little bit of everything in one bite. 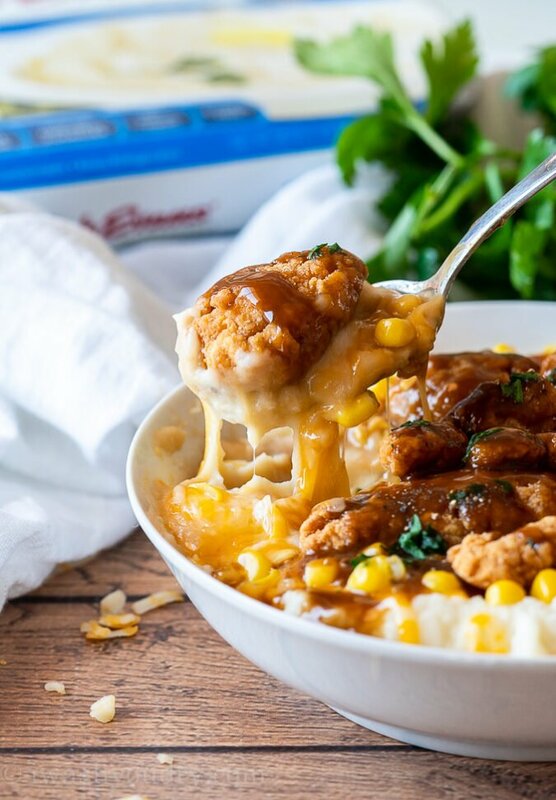 Creamy, cheesy mashed potatoes, sweet corn and crispy chicken all smothered in warm brown gravy… SO GOOD! I know you and your family are going to love this super quick dinner recipe! THE RECIPE SAY “POPCORN CHICKEN NOT STRIPS” ?????????????? Looks scrumptious but not very healthy. 1,480 mg of sodium!!!!! It’s very delicious! You could always make a half portion if you’re concerned about the sodium level.